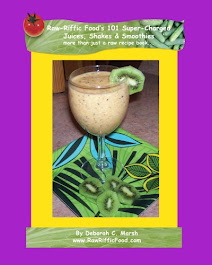 Join me through this wonderful journey of vibrant health, wealth, and well-being through a diet high in raw and living foods, and through a positive and powerful self. Raw-Riffic Food is a free informational site for raw and living food enthusiasts, and especially for those individuals that are interested in learning more about living a healthier, more vibrant, and happier life by transitioning to a diet high in fresh, organic, raw and living foods. To share my research, knowledge, and experience with others on how to live a more healthful, vibrant, and happier lifestyle through a diet high in fresh, organic, raw and living foods. Raw-Riffic Food is a free informational site for raw and living food enthusiasts, and especially for those individuals that are interested in learning more about living a healthier, more vibrant, and happier by transitioning to a diet high in fresh, organic, raw and living foods. This site is truly a work in process. I am always open to suggestions and contributions to help improve the value of this site. 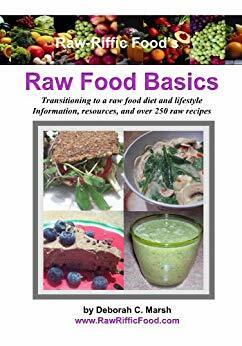 I have included a lot of content on this site as a way of presenting various components of the raw and living food diet and lifestyle, with hopes that it will provide you (my visitors) with meaningful and empowering information to help you with your own personal life journey. Get Updates by Subscribing to the Raw-Riffic Food e-newsletter and blog. The content on this site is based on personal opinion, experience, and research, and is intended for optional information and recreational purposes only. The content on this site is not intended as medical advice, or to dictate lifestyle changes as it relates to an individual's personal health and well-being. Always consult a medical professional and an certified nutritional expert before considering any changes to diet or lifestyle. The creator and host of this site will NOT be held responsible for the use or misuse of information found on this site, and is NOT responsible for any liability, loss, or risk, personal or otherwise, which is incurred as a consequence, directly or indirectly, of the use and application of any the content found on this site or recommended or referred within the content on this site, or it's linked partners.